What makes Seattle such an attractive market? We have heard much of the news lately about 3 potential ownership groups interested in brining an NHL franchise to Seattle. 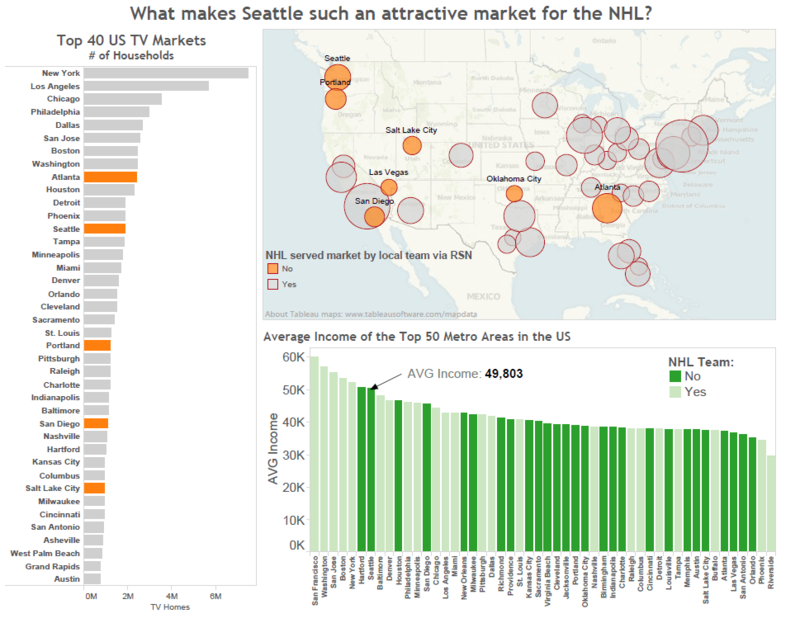 It is also clear that the NHL views Seattle as an attractive market. So what makes Seattle such an attractive market? Regional Sports Networks (RSN) are a critical revenue stream to pro sports these days. Seattle is the second biggest DMA that is currently without a regular NHL team on a local RSN. Root Sports Northwest currently serves about 3 Million households a month in Washington, Oregon, Idaho, Montana and Alaska. Although small, those last two states are fairly significant considering their appetite for hockey. From a national perspective, having a team in Seattle should help NBC/NBC Sports numbers as well. It should be pointed out that our current viewership is split with CBC. That will change over the next few years as the HNIC broadcast will be of lower significance as the Rogers deal in Canada takes hold. Of the top 50 biggest metropolitan areas in the country, Seattle ranks 7th in Average income and is the 2nd highest average income city without an NHL team. Hartford has a slightly higher Average Income but roughly a third of the population of the Seattle area. Houston and Sacramento are served by a local NHL team? News to me! TV wise yes, both of those markets have an RSN that shows a full season hockey schedule. Sharks and Stars. Expansion or relocation ? I personally would not give up on Phoenix/|Arizona/whatever. Personally I think the whole ownership situation and basic lack of revenue, even with the fabulous new TV contract, will work against their viability. Jobing.com is about 1/3 to 1/2 full for league games, only fills during the playoffs, which is not a sound financial basis. Winnipeg purchased Atlanta for around $175M ($60M purchase, which is what it was worth in that market, about $110M “relocation fee”). NHL would not want relocation, most likely, except under further dire straits. But Seattle would likely have a much more viable franchise quicker. Strong local ownership crucial, one party has to have 51% or more, perhaps a couple of minority shareholders — this was a big problem in Atlanta. In Winnipeg David Thompson has around 90% of True North Sports and Entertainment, Mark Chipman the rest. Mind you, Thompson is thought to be worth around $20B.